According to the Bible, James, who wrote the book of James found in the New Testament, was the brother of Jesus Christ. Mark 6:2-3 says: "And when the Sabbath had come, He began to teach in the synagogue. And many hearing Him were astonished, saying, "Where did this Man get these things? And what wisdom is this which is given to Him, that such mighty works are performed by His hands! "Is this not the carpenter, the Son of Mary, and brother of James, Joses, Judas, and Simon? And are not His sisters here with us?" Evidently, after the virgin birth of Jesus, Joseph and Mary had sons and daughters of their own. "But I saw none of the other apostles except James, the Lord's brother." "Upon the death of Festus ( 62 A.D.), Emperor Nero sent Albinus to be procurator of Judea. But before he arrived, King Agrippa appointed Annas to be High priest. He was the son of the elder Annas. (Note: The elder Annas referred to here is the same Annas of the New Testament Gospels.) The elder Annas had been high priest himself for a time. He had five sons all whom secured the priesthood. Annas the younger, however, was a brute who observed the ways of the Sadducees who are known as being cold-hearted when they sit in judgement. 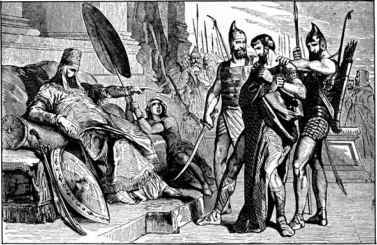 With Festus dead and Albinus still traveling, Annas thought he could have his own way. Calling forth the members of the Sanhedrin, he brought before them a man named James, the brother of Jesus who was called the Christ, and others with him. 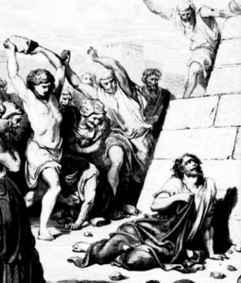 He accused them of violating the law, and ordered that they should be put to death by stoning." Although the Bible doesn't mention it, Joseph-us states that James was martyred by the Sanhedrin.